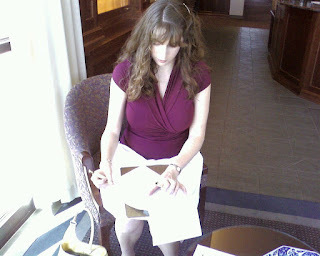 On Monday, September 8, I signed a two-book contract deal with Harvest House Publishers. The first book, Plain Jayne, will be released in 2010. The second, most likely a spin-off follow-up, will be released in 2011. Monday was great fun, if a bit overwhelming. I arrived at Harvest at noon for my tour of the building. Accompanied by my fantastic agent Sandra, we toured around and met a great many people. After lunch down the road, we returned and commenced the signing of the contracts. Signing contracts is not unlike signing a will. It's legally binding and requires you to pratice your signature in a variety of locations. Frankly, it's been useful in keeping my wordcount up. Granted, I did the month-count and found that, with the pace I've been working at, I'll land right where I wanted to be if I continue the death march (see http://www.despair.com/quality.html) without slowing until the end of March. While comforting, after last Christmas's craziness, I realize having some additional buffer time is kinder to my peace of mind, as well as my husbands. Madness is what we're hoping to avoid, but as a fiction writer, I an realistic (see http://www.despair.com/madness.html). 1. I cut off seven inches of hair. 2. I have finished 2 1/2 chapters since signing. 3. The little children in our complex have started school, and life is quieter. 4. I will be learning to ride a motorcycle in two weeks. 5. I will have to wear hiking boots for that event. 6. I don't know that I've ever worn hiking boots. 7. My home is still untidy, but with the landlord inspections occuring next week, that will have to change. 8. I finished (mostly, save the button) a sweater (more on the similarities between writing and knitting later. 9. I made a blueberry-raspberry grunt Wednesday. If you enjoy baking and don't have Mary Englebreit's Sweet Treats cookbook, then hie thyself to half.com. It's the best. 10. Both books (Plain Jayne and Untitled) have ISBNs. Which means that, at some point, the madness I see onscreen will turn into a real, live, paper-filled book. How exciting!! The feeling of signing for your first book. The sky is the limit now. Once you are established, you will open new doors. I wish you the best, and I hope we will cross paths at a conference, or some event in the future.